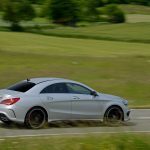 With the CLA Mercedes opened up a new segment of compact four-door coupes, and not without success! 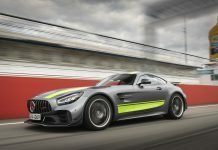 The AMG version has now arrived, complete with the most power dense 4-cylinder engine in the world. 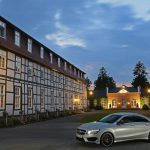 We were invited by Mercedes-Benz to take a closer look at the CLA 45 AMG on a drive from Hannover to the new Bilster Berg race track! 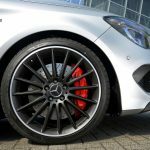 The Mercedes-Benz CLA 45 AMG is, mechanically, almost identical to the Mercedes-Benz A 45 AMG which received its official launch around the same time. 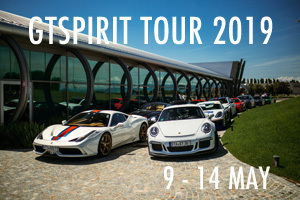 Both cars feature the new 2.0 litre turbocharged four-cylinder and both produce a substantial 360hp peak power figure. The differences, aside from the bodywork, are subtle but they are definitely present. 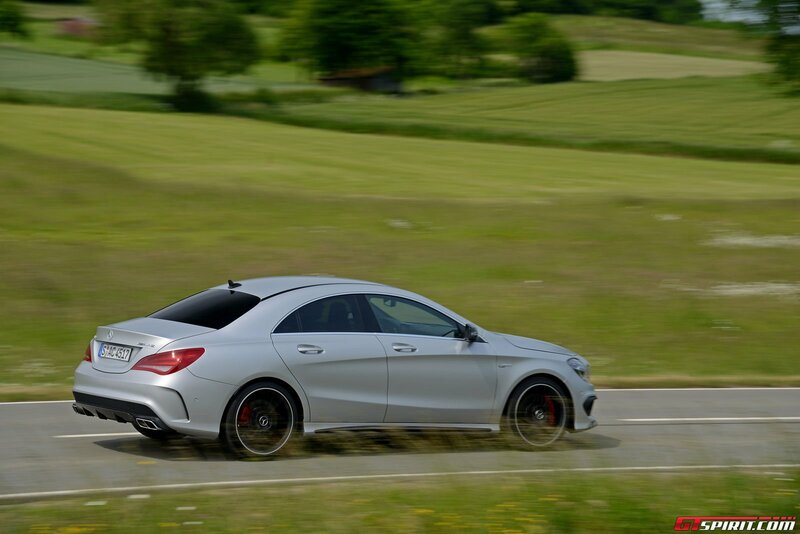 The CLA 45 AMG for example features a slightly modified exhaust system with less rasp and crackles that the A-Class. It also differs in terms of the ride quality. 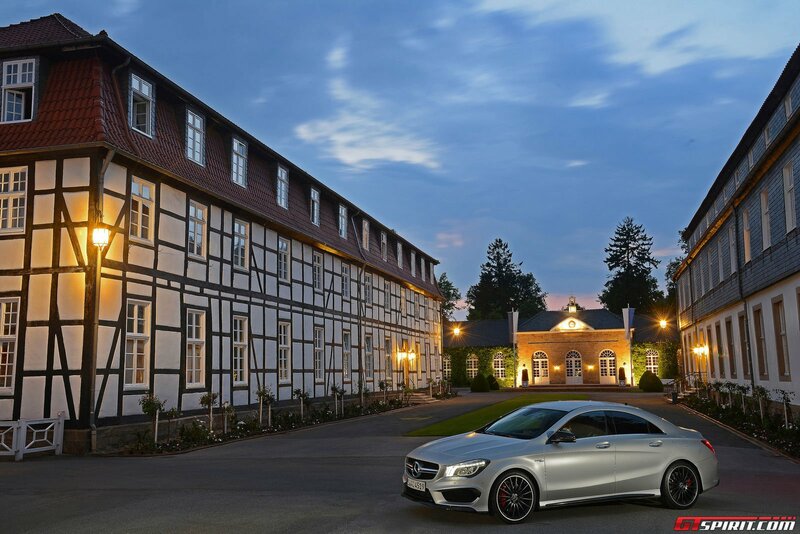 With the CLA geared towards those more conservative in taste, the CLA 45 AMG has a noticably less harsh ride. The dampers are slightly softer in the CLA, this is a conscious decision to differentiate the two cars. Perhaps the most stunning aspect of the car is the bodywork. From the front the CLA 45 looks almost identical to the A45, the slightly lower roof line is the only thing giving the CLA away. 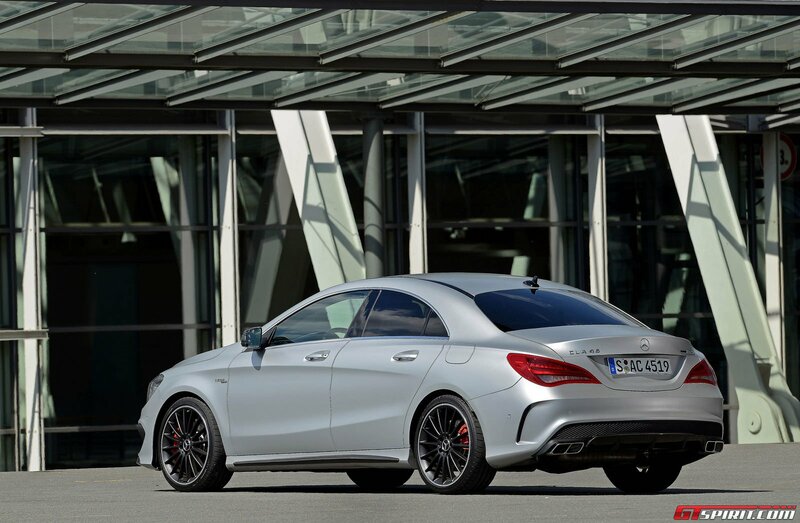 From the side and rear however the CLA looks nothing like its hot-hatch brother. 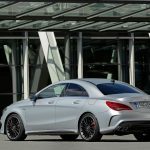 The long lines that travel the length of the car indicate that the CLA 45 AMG is meant to appeal as a smaller and cheaper version of the CLS 63 AMG. 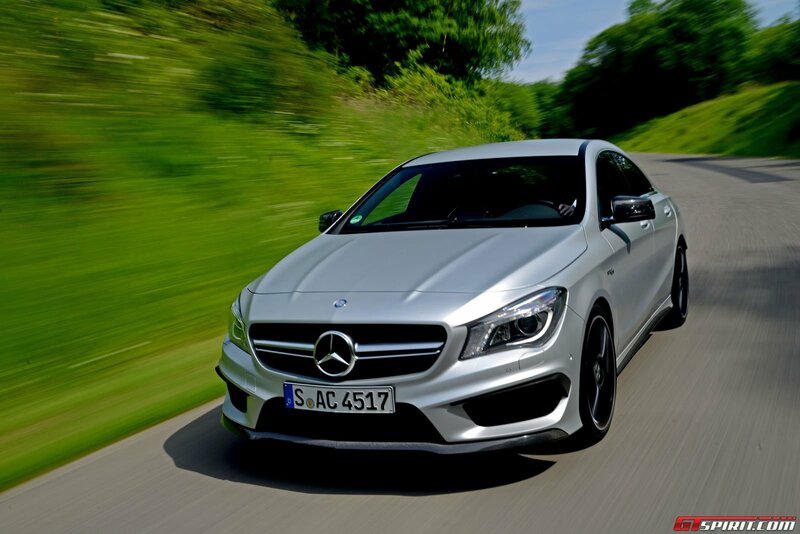 With the AMG additions, the larger rims and the low coupe stylings, the CLA 45 AMG is a definite head turner. 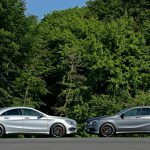 The CLA is actually longer and wider than a C-Class, although you won’t notice it unless you compare the two side by side. 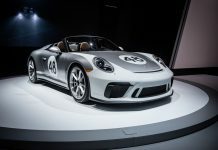 The cosmetic differences are taken care of through larger, deep-gray intake ducts, a twin-blade grille, wider side skirts, a deeper rear bumper and twin chrome exhaust tips. Inside, the CLA 45 AMG is almost identical to the A 45 AMG. It has the same sports seats with alcantara, leather and faux carbon fibre trims. 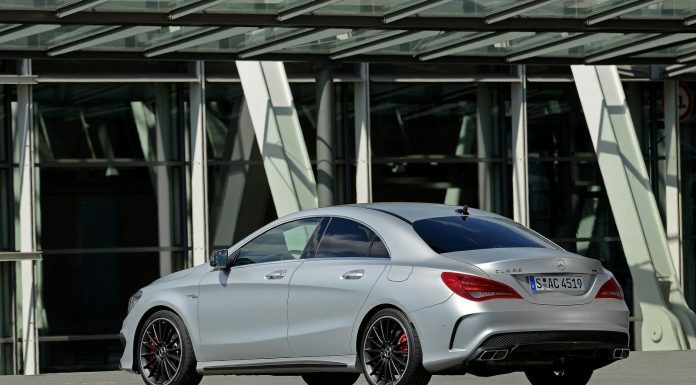 You can order the CLA 45 AMG with a real carbon-fiber trim package if you wish. 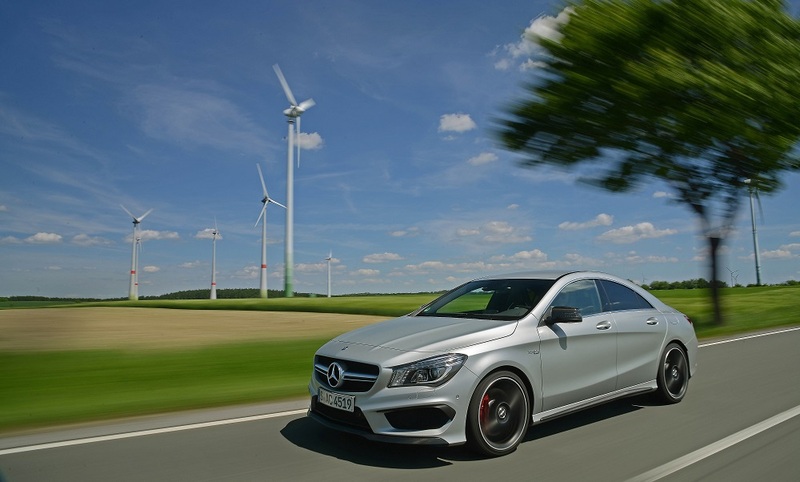 As with the A 45 AMG, indicated fuel consumption is an impressive 40.1mpg. This wouldn’t normally be a talking point for a GTspirit review, yet we suspect that the CLA 45 AMG will probably be used as an everyday car. It has to be said, if you manage to keep your right foot from pressing down to hard the fuel economy is indeed quite impressive, however as soon as you put your foot down a bit too much the fuel economy soon reminds you what kind of car you are in. 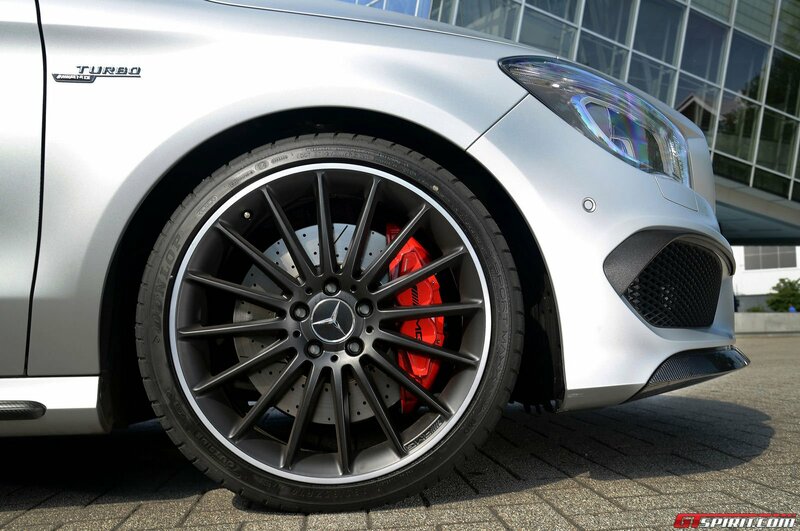 The four-wheel drive system – one of the first system’s fitted to an AMG road car – is an amazing piece of engineering. Most of the time when you aren’t pushing to the limits, it operates sending most of the power to the front wheels. 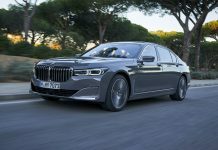 At lower speeds the driver is less inclined to notice the handling characteristics so this doesn’t appear to be much of an issue. Push a little further though and the power starts to move to the middle of the car. It does this in an instant, perfect for pulling into that small slot on a busy roundabout. 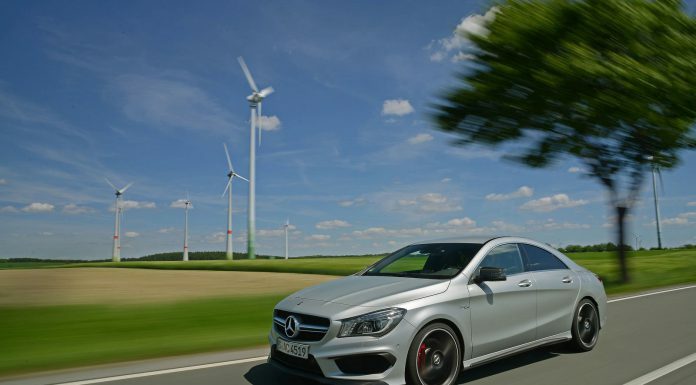 As the CLA 45 AMG isn’t naturally aspirated, the power delivery tends to be towards the higher end of the rev range. A a result it feels almost docile to drive at lower speeds creating a quiet interior space for those moments when you require. 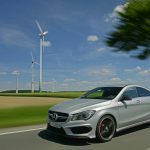 Efficient mode will add some extra economy for city drivers that aren’t too bothered about driving their CLA aggressively. It utilizes a stop-start mechanism and engages the lowest possible gear. For those that are interested in using the car’s power, it saves vital fuel for the race track or a quiet country road. 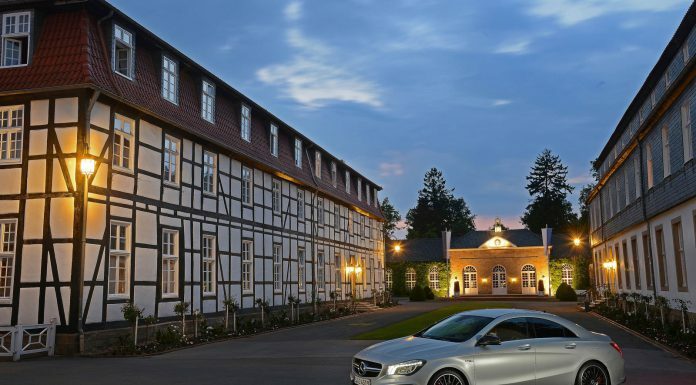 Heading out on the quiet roads around the Bilster Berg, the CLA 45 AMG feels lively and rides well. Interestingly, the steering rack is constant and does not adapt to increased speeds which means more lock is required when really pushing the car. As we build speed and head into a combination of corners this becomes apparent, yet the feel is still precise and direct. 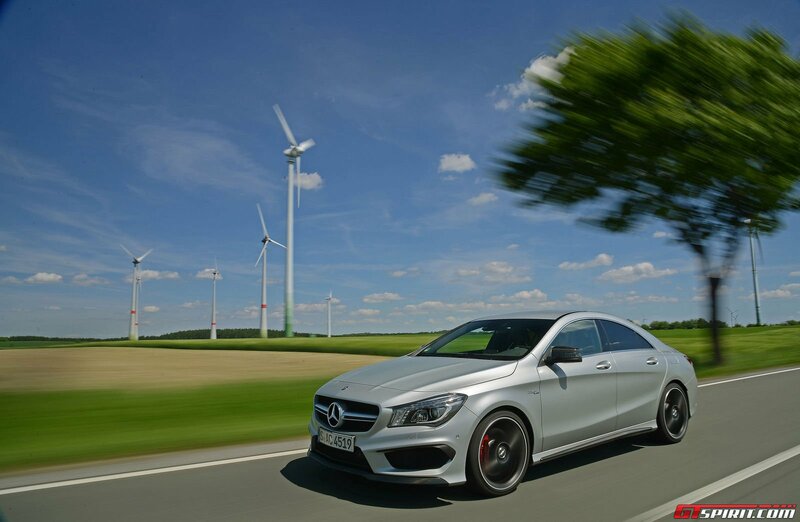 The CLA 45 AMG comes with a seven-speed twin-clutch gearbox. 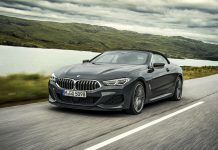 It is silky smooth and instantaneous when driving around on country roads and accelerating in the city, occasionally the downshifts appear to take a little too long. Most drivers of the CLA 45 AMG will hopefully not spend too much time driving in automatic mode, but use the flappy paddles instead. 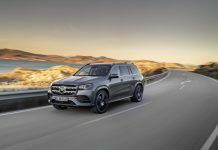 Moving through the corners, the four-wheel drive system starts to impress. It delivers grip right when the car requires it and for short bursts, can infact transfer all power to the rear of the car. 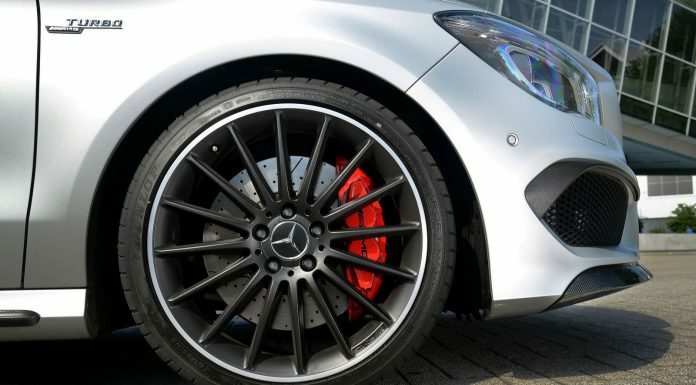 The brakes are impressive too, providing a confident and effective bite. 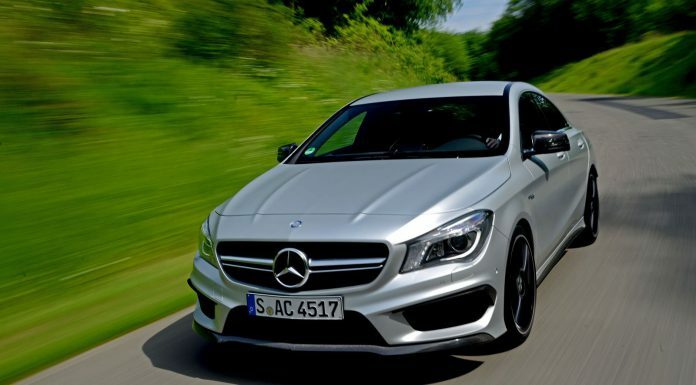 Overall, the package is impressive, equal to that of the A 45 AMG yet offering more of a “grown-up” feel. On the way back to Hannover we had one last change to put the CLA 45 AMG to the test on a stretch of unlimited German Autobahn. The acceleration for a 2 liter four cylinder is nothing short of impressive, and won’t leave you disappointed. Even at higher speeds there is always enough torque available to sprint away. However the stiff suspension takes bumps at higher speeds quite hard which sadly doesn’t make it the best autobahn cruiser. 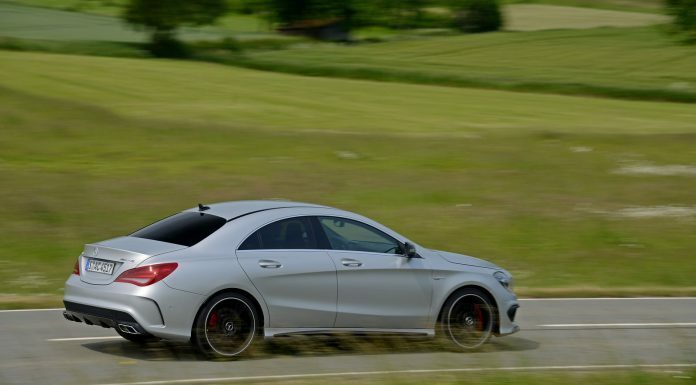 Ultimately, you can see the thought process AMG employed to come up with the CLA 45 AMG. 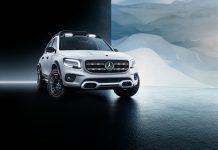 Essentially it had to surpass everything in the market segment in a package that appeals to all. 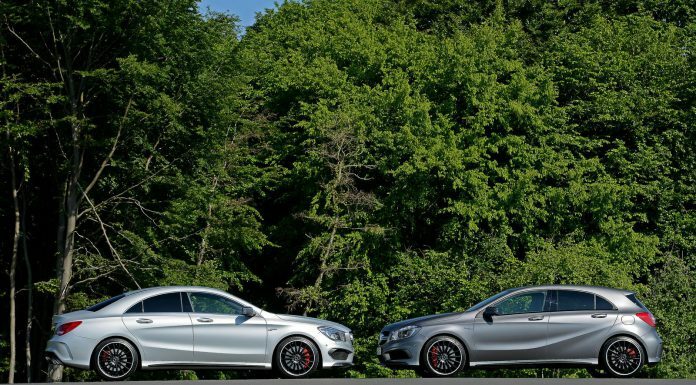 Offering the A-Class and the CLA-Class together gives a fantastic market reach, if you aren’t sold on the looks of one then you always have the option of the other. 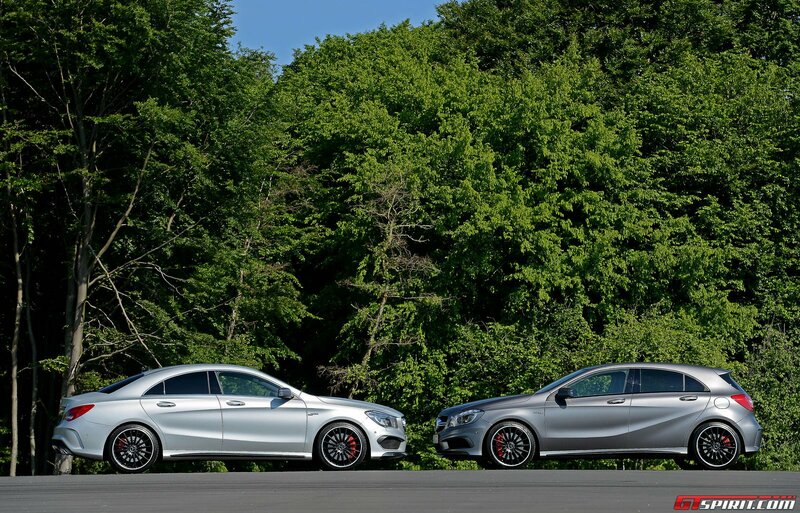 Both the A and CLA can be considered real game changers for Mercedes-Benz. They appeal to a much younger and trendier audience, which brings the brand with the Star a much needed impulse. Hopefully the positive impact of the A and CLA 45 AMG also affects the other cars in the line-up. For a few years I, myself, would never buy a Mercedes, but with the arrival of the refreshing A and CLA I’m for the first time seriously tempted to buy one. The CLA 45 AMG is a fantastic machine. 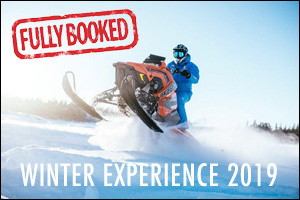 It offers class leading performance with a definite amount of innovation. 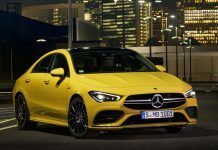 It does exactly the same job as the A 45 AMG, yet offers that extra element of coupe style flair that the A 45 AMG perhaps lacks! 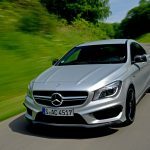 The 2014 Mercedes CLA 45 AMG will see first customer deliveries in September 2013 and, unlike the A45 AMG, will also be sold in the United States!